Continuity mistake: When Carina escapes from her jail cell, just after we hear Mayor Dix dedicate the Royal Bank of St. Martin, in the closeup we see the locked shackle around Carina's left wrist and the hanging links with the other shackle dangling. Then when Mr. Swift sees Carina handling his telescope, in this closeup we see the shackle links are hanging the opposite way, revealing that the locked shackle around her left wrist had been the dangling shackle from the earlier shot. Continuity mistake: After Carina tells Jack and the others that she's an astronomer which has nothing to do with donkeys, when Jack threatens to kill Henry in the shot facing him he's holding his left hand up pointing at Henry, but in the next shot facing Henry it's Jack's right hand up pointing at Henry. Trivia: The severed heads in the guillotine basket are of the film directors Joachim Rønning and Espen Sandberg. Trivia: The ship we see Jack on in Salazar's flashback is called the Wicked Wench. This is a bit of an in-joke for PotC buffs, because that was the original name of the Black Pearl before being sunk by Cutler Beckett and raised again by Davy Jones. It's fully explained in a deleted scene of At World's End. Trivia: The Latin inscription on the diary reads "Verum omna simul astra", which means "All the stars speak the truth always." Henry: I saw her ankles. Captain Jack Sparrow: You would've seen a lot more if you kept your cakehole shut. Captain Jack Sparrow: There's no need for name calling. Captain Salazar: Jack Sparrow... Do you know this pirate? Captain Salazar: For too many years the Triangle has cursed us, condemned us to this Hell on Earth. The key to our escape is Jack Sparrow, and the compass which he holds. No, no. No need to fear, me boy. I always leave one man alive, to tell the tale. Find Sparrow for me and relay a message, from Captain Salazar. Captain Salazar: Tell him I'll behold the daylight again. And on that day, death... death comes straight for him. Would you say that to him, please? Captain Salazar: I wish I could tell him myself, but dead men tell no tales. Question: At the very beginning of the film, young Henry boards the Flying Dutchman to speak to Will. When Will looks behind him, he sees the shadows of several crew member starting to make their way towards him and he suddenly gets frightened that the crew will see Henry. Why would he react this way? Since he's captain of the Flying Dutchman, if his men saw Henry, Will could order them to leave Henry alone. Answer: He's probably worried that either the crew will attack or at very least frighten Henry. Or he just doesn't want Henry to see how horribly the curse can affect people. 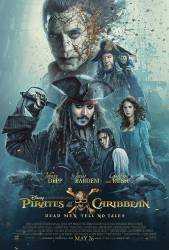 Question: I just watched the movie and now I just have one question; wasn't it Tia Dalma who gave Jack the compass? In Dead Man's Chest she asks him if the compass he bought from her can't lead him to Davy Jones' chest. But in the newest movie a captain gives the compass to Jack. Chosen answer: Jack was quite young when he first come into possession of the compass. In the following years he could have lost it, bartered it, had it stolen or whatever before it came back into his possession by way of Tia Dalma. Answer: Jack could've been sent by his former captain to obtain it from Tia Dalma. Question: What happens to Will's heart after the curse is broken? Last we saw it, at the end of "At World's End," Elizabeth had possession of it and promised to keep it safe. Did it just spontaneously return to Will at some point? Answer: There was never any explanation other than Elizabeth kept it in the chest. As both the Elizabeth and Will characters are rumored to return in POTC 6, the question may be answered in that installment.